From January, 2012, Sri Lanka has made it mandatory for everyone (except the Republics of Singapore, Maldives, and The Seychelles) who is entering their country to apply for ETA for a short visit to Sri Lanka. The main objective of ‘Sri Lanka Visa’ is to facilitate the legal entry and to regulate the stay period of non Sri Lankans. 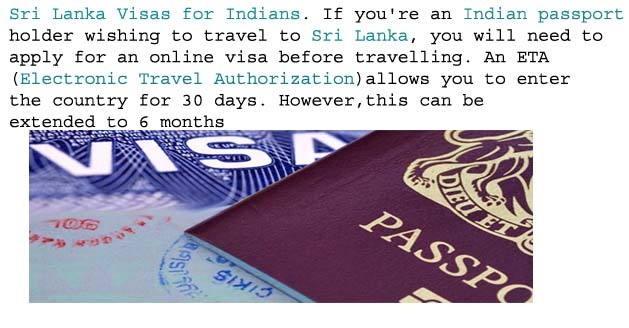 A visitor should obtain an Electronic Travel Authorization (ETA) / short term visa to visit Sri Lanka for a short term for tourism, business or transit purposes. 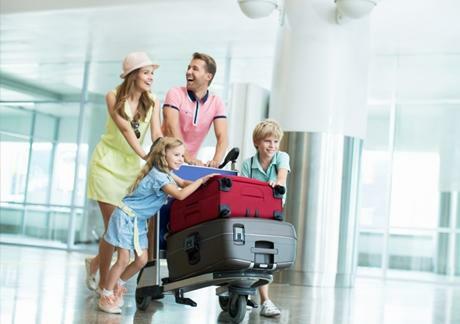 Electronic Travel Authorization (ETA) is an online system which provides official authorization for short visits (up to 30 days), and is issued electronically. Those who wish to undertake short-term visits must obtain an ETA prior to their arrival in Sri Lanka. TOURIST VISA- A tourist visa is issued to those who are planning to visit the country for tourism purposes. A visitor can apply for ETA online by going to the official ETA website www.eta.gov.lk or can visit www.sri-lankaeta.com to get Sri Lanka Online Visa application form. The Visa contains details of the period of time and the condition/s of the stay. Purpose for tourist visa- Holidaying, Sightseeing, excursions & relaxation, visiting family or friends, medical issues or treatments which includes yoga and Ayurveda treatment or participating in any kind of sporting competitions, events and activities. BUSINESS VISA- A Business Purpose Visa is issued to foreign nationals who visit Sri Lanka for business purposes for a short period of time. This visa may be issued for single, double or multiple journeys. Purpose for business visa- Conferences, meetings, seminars, business negotiations, workshops, short term training programs, participation in social events, religious events and symposiums! 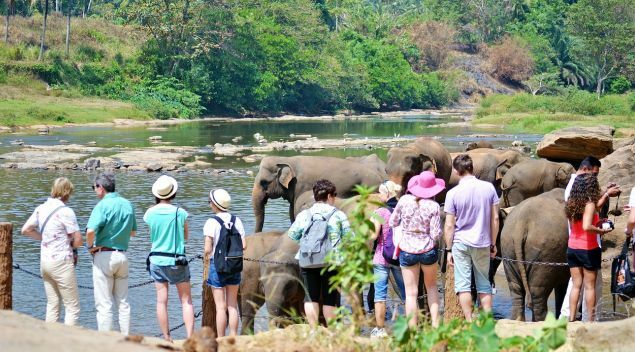 As long as you do not intend to stay in the country longer than 30 days, you can take part in conventions and conferences as well as meetings whilst in Sri Lanka. TRANSIT VISA- Transit visa is issued to people wishing to transit through Sri Lanka who enters the country for short period of time or traveling to Sri Lanka to join a vessel as crew. A transit visa is not required if you fly out on the same aircraft and from the same airport at which you arrived or you stay in the transit lounge and do not leave the airport. Business Visa, tour-travel, tourist visa, Transit Visa, Uncategorized, visa Business Visa, Documents required to apply for Tourist ETA, ETA Visa applications, Sri Lanka ETA website, Sri Lanka visa, tourist visa, TRANSIT VISA, www.eta.gov.lk. permalink. Hello! I just would like to give an enormous thumbs up for the good information you’ve gotten right here on this post. I will likely be coming back to your weblog for more soon. Wow, that’s what I was searching for, what a information! present here at this webpage, thanks admin of this web page.